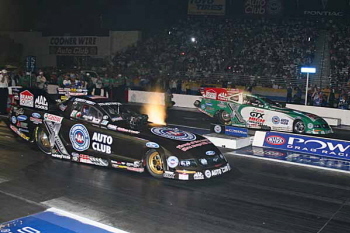 The Automobile Club of Southern California NHRA Finals are unique in many ways; one is that in the “Pro” classes there are 2 champions crowned when the smoke clears. 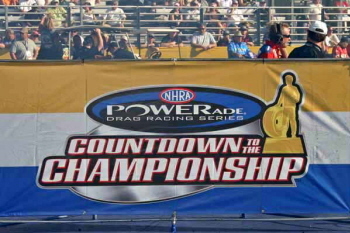 The Automobile Club of Southern California NHRA Finals winners and the POWERade season champions, which are now determined by a system called “Countdown to the Championship”. 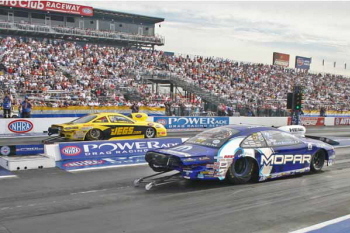 Basically, the “Countdown” means that all “Pro” class competitors compete for the POWERade Championship through 75% of the season. 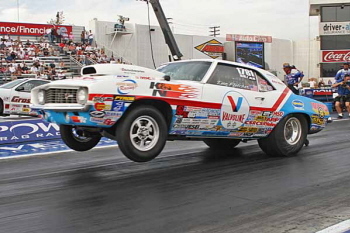 With approximately 6-7 races left in the season, the competitors are reduced to the top 8 in each “Pro” class. 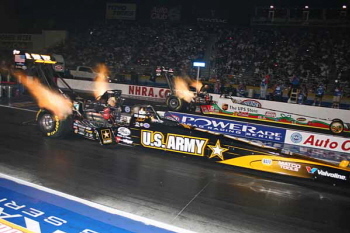 With 4 races left, the competitors are reduced to the top 4. 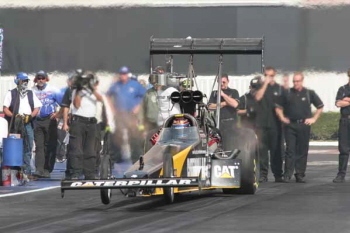 Rod Fuller lead the Top Fuel “Countdown” field into Pomona with a lead of more than two rounds, with former two-time champ Larry Dixon right behind him and Brandon Bernstein, in third. 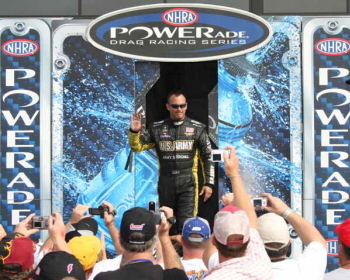 Four-time and reigning NHRA POWERade Drag Racing Series Top Fuel champ Tony Schumacher sat in fourth place, three rounds out of the lead. 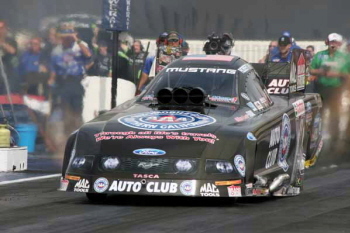 Tony Pedregon entered the Funny Car “Countdown” with a comfortable 91-point edge on Gary Scelzi, with Robert Hight in third, and Ron Capps in fourth. 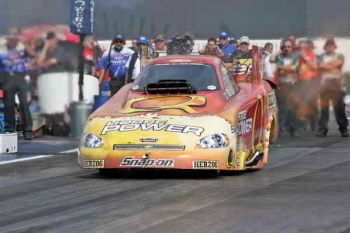 Greg Anderson was leading the Pro Stock “Countdown” with a slim lead over Team Cagnazzi drivers Jeg Coughlin and Dave Connolly, Mopar campaigner Allen Johnson was fourth. 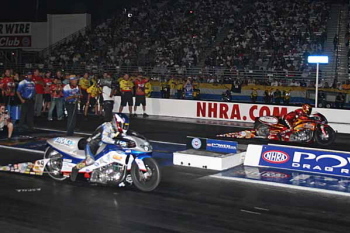 The Pro Stock Motorcycle “Countdown” was lead by Andrew Hines followed by Chip Ellis, Matt Smith , and Peggy Llewellyn. 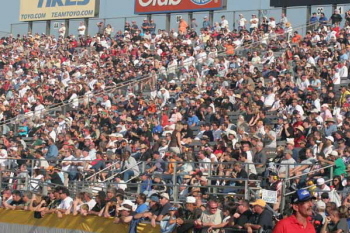 The weather in Pomona, CA was perfect for the cars and the huge throngs of fans. 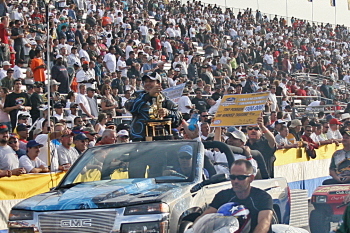 On Sunday, just before final rounds, an awesome ceremony was produced to tribute Wally Parks, NHRA’s late founder. 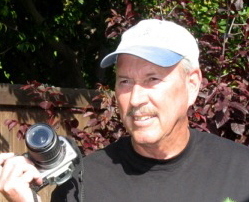 Thanks for the Show! 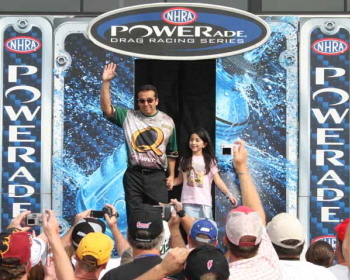 Tony Pedregon wins the Funny Car NHRA POWERade Drag Racing Series Championship. 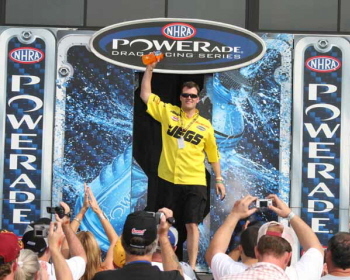 The Pro Stock NHRA POWERade Drag Racing Series champ was determined in the third round when Jeg Coughlin (far lane) beat Richie Stevens. 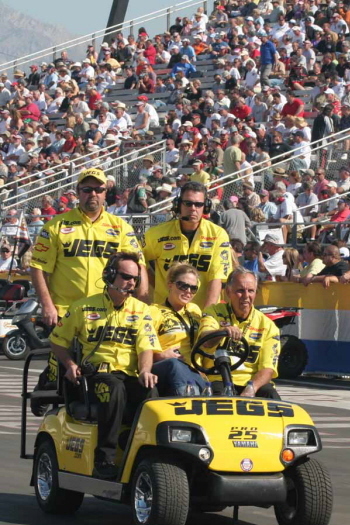 Jeg Coughlin (near lane) and Greg Anderson battled all year. 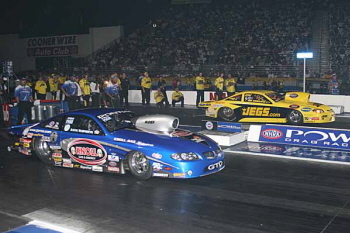 The Super Gas class started with over 100 contestants, 7 rounds later we’re down to 2. 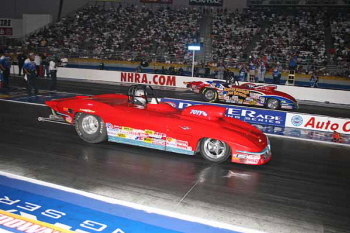 Steve Parsons (near lane) defeats Randy Balough for the Auto Club of Southern California NHRA Finals Super Gas winner! 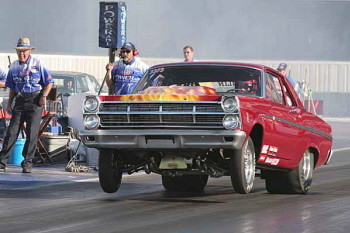 Many NHRA Divisions are represented at the Finals, like this very nice 460 Ford powered Ford Fairlane from Division 3. 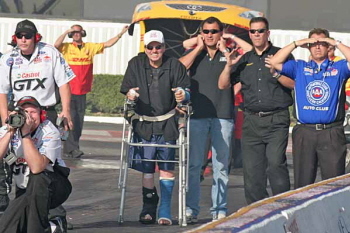 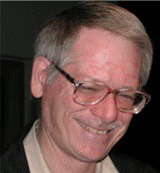 Just before final rounds, an awesome ceremony was produced to tribute Wally Parks. 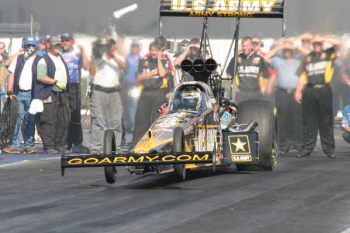 John uses his “new wheels” to get to the start line every time one of his teammates are running! 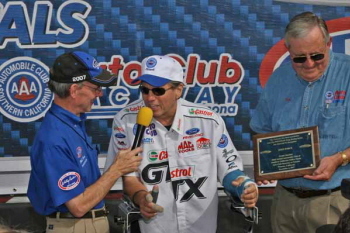 Frey interviews John Force after Tom McKernan (Auto Club of Southern California) honors him as, Grand Marshall of the Auto Club of Southern California NHRA Finals. 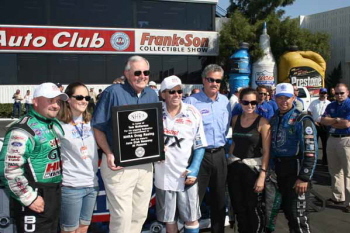 Surrounded by his friends, Tom McKernan (Auto Club) receives an award from Tom Compton (NHRA) for the Auto Club of Southern California’s sponsorship of the NHRA Finals. 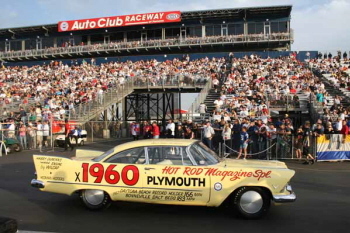 – Not all the big horses were on the track. 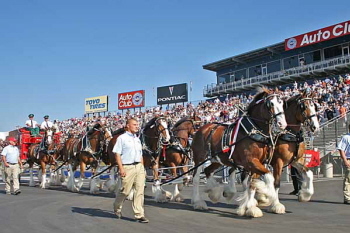 The Budweiser Clydesdales are always a winner.